David Beckham hit the beach in Malibu with his son Romeo last week, and thanks to his tendency to go shirtless and show off his ripped body, the three new tattoos he got inked on his sides recently were perfectly on display. David played the part of the proud papa as he videotaped his 12-year-old son taking surf lessons on October 23, but all eyes were on David himself and his brand-new ink. Becks may no longer be playing professional soccer, but it’s obvious he works hard to stay in shape, and his toned and muscular body is the perfect canvas for his ever-growing collection of tattoos. Just one month after revealing the new “Dream Big, Be Unrealistic” tattoo on his hand, David Beckham has gone under the needle yet again, adding three new tattoos to his sides. The first David Beckham tattoo is the date “1975” inked in tiny black numbers on his left side, just below his chest, and next to his tattoo of Chinese letters reading “Death and life have determined appointments. Riches and honor depend upon heaven.” The meaning behind David’s side tattoo is apparently his birth date, since the 39-year-old was born in the UK on May 2, 1975. It seems odd that David would get a tattoo of his own birth year, but most of his other tattoos are dedicated to his wife, three sons and daughter, so why not get a little something for himself too? David’s second new tattoo is inked on his right ribcage, just above his Man of Sorrows Jesus tattoo, and features a large block of writing that appears to be either a quote or a passage from the Bible. David Beckham certainly has an affinity for textual tattoos, and he already has a dozen or more honoring the love he shares with his wife of 15 years. He also loves tattoos written in foreign languages, like his “Victoria” Sanskrit, the “So that I love and cherish” Latin, and the “I am my beloved’s and my beloved is mine” Hebrew tattoos on his arms. He also has quite a few religious tattoos scattered across his body, including the “pray for me” tattoo on his wrist, the Man of Sorrows tattoo on his side, and the Jesus and cherubs tat on his chest. The writing in David’s side tattoo remains a mystery, but we have a feeling it holds an important meaning for the soccer star. The last of David Beckham’s new tattoos, which reads simply “Mum & Dad,” is located on the soccer star’s left side, just below his new “1975” tattoo, and so close to his Chinese letters tattoo that they are almost touching. The model and soccer star’s “Mum & Dad” tattoo is inked in an elegant black script font, like most of David Beckham’s tattoos, and has a couple of possible meanings. Either the 39-year-old got the tattoo as a tribute to his own mother and father, David and Sandra Beckham, or the ink was meant as a nod to his children, who have shown an interested in getting inked up just like their father. During a 2013 interview on The Jonathan Ross Show, David revealed that his boys, Romeo, Brooklyn and Cruz, have already made plans to get “Mum & Dad” tattoos when they are older. 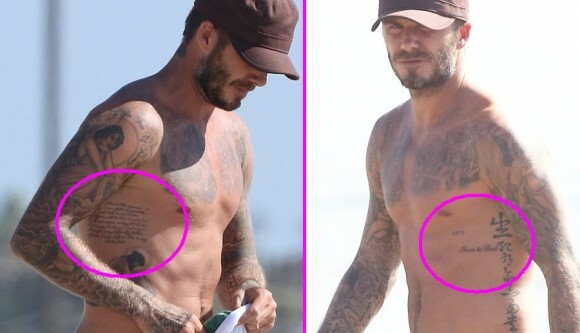 Perhaps David thought by getting his own “Mum & Dad” tat, he and his kids would eventually end up with matching tattoos!